Cannabinoids and the endocannabinoid system have attracted considerable interest for therapeutic applications. Nevertheless, the mechanism of action of one of the main nonpsychoactive phytocannabinoids, cannabidiol (CBD), remains elusive despite potentially beneficial properties as an anti-convulsant and neuroprotectant. Here, we characterize the mechanisms by which CBD regulates Ca2+ homeostasis and mediates neuroprotection in neuronal preparations. Imaging studies in hippocampal cultures using fura-2 AM suggested that CBD-mediated Ca2+ regulation is bidirectional, depending on the excitability of cells. Under physiological K+/Ca2+ levels, CBD caused a subtle rise in [Ca2+]i, whereas CBD reduced [Ca2+]i and prevented Ca2+ oscillations under high-excitability conditions (high K+ or exposure to the K+ channel antagonist 4AP). Regulation of [Ca2+]i was not primarily mediated by interactions with ryanodine or IP3 receptors of the endoplasmic reticulum. 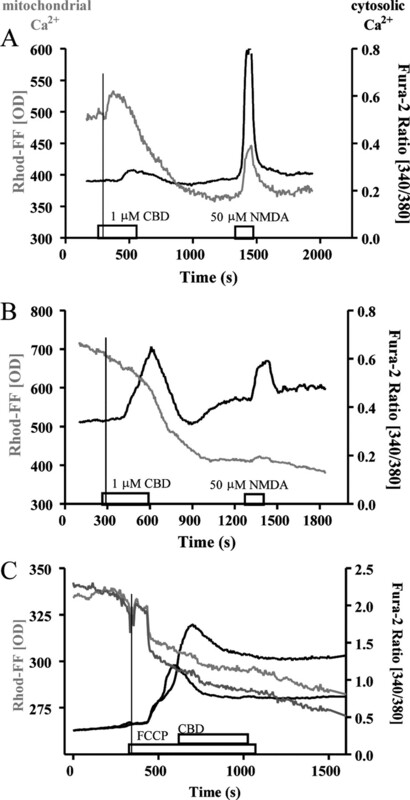 Instead, dual-calcium imaging experiments with a cytosolic (fura-2 AM) and a mitochondrial (Rhod-FF, AM) fluorophore implied that mitochondria act as sinks and sources for CBD's [Ca2+]i regulation. Application of carbonylcyanide-p-trifluoromethoxyphenylhydrazone (FCCP) and the mitochondrial Na+/Ca2+ exchange inhibitor, CGP 37157, but not the mitochondrial permeability transition pore inhibitor cyclosporin A, prevented subsequent CBD-induced Ca2+ responses. In established human neuroblastoma cell lines (SH-SY5Y) treated with mitochondrial toxins, CBD (0.1 and 1 μm) was neuroprotective against the uncoupler FCCP (53% protection), and modestly protective against hydrogen peroxide- (16%) and oligomycin- (15%) mediated cell death, a pattern also confirmed in cultured hippocampal neurons. Thus, under pathological conditions involving mitochondrial dysfunction and Ca2+ dysregulation, CBD may prove beneficial in preventing apoptotic signaling via a restoration of Ca2+ homeostasis. Two fundamental determinants of neuronal survival and viability under pathological conditions are Ca2+ homeostasis and metabolic activity, both reliant on mitochondrial function. Neurons have a particularly high energy demand and correspondingly high metabolic activity, alongside large fluctuations in [Ca2+]i; thus, mitochondria play a particularly important role in this cell type. Even subtle mitochondrial deficits can have deleterious effects that can ultimately result in degenerative processes (for review, see Kajta, 2004). Energy deficiencies are also associated with aging (Bowling et al., 1993) (for review, see Wiesner et al., 2006) and age-related disorders, e.g., Alzheimer's disease (de la Monte and Wands, 2006), indicating a correlation with mitochondrial dysfunction, as also recently suggested by a corresponding treatment success in Alzheimer's patients (Doody et al., 2008). Mitochondria are preferentially located in areas of highest [Ca2+]i adjacent to the endoplasmic reticulum, essential for the functional coupling of these two organelles (Robb-Gaspers et al., 1998; Szabadkai et al., 2003; Saris and Carafoli, 2005). Moreover, mitochondria determine cellular survival by generation of reactive oxygen species (Lafon-Cazal et al., 1993) and apoptotic factors (Hong et al., 2004). This process involves an increased permeability of mitochondrial membranes [including opening of the mitochondrial permeability transition pore (mPTP) (Hunter et al., 1976)]. Therefore, identification of agents that can restore normal mitochondrial function is highly desirable. The plant Cannabis sativa has for many centuries been reputed to possess therapeutically relevant properties. Its most widely studied and characterized component, Δ9-tetrahydrocannabinol (THC), is one of 60+ compounds from Cannabis sativa, collectively known as phytocannabinoids. However, THC may have a limited usefulness due to psychoactivity, dependence, and tolerance (Sim-Selley and Martin, 2002); therefore, attention has turned to some of the nonpsychoactive phytocannabinoids, most notably cannabidiol (CBD). CBD has little agonistic activity at the known cannabinoid receptors (CB1 and CB2) (Pertwee, 2004), and may possess therapeutic potential, e.g., anti-epileptic (Cunha et al., 1980), anxiolytic (Guimarães et al., 1994), anti-inflammatory (Carrier et al., 2006), and even anti-psychotic properties (Leweke et al., 2000) [for review, see Pertwee (2004) and Drysdale and Platt (2003)]. In addition, CBD has shown neuroprotection in a range of in vivo (Lastres-Becker et al., 2005) and in vitro models (Esposito et al., 2006), some in association with a reduction in [Ca2+]i (Iuvone et al., 2004). The highly lipophilic nature of cannabinoids grants them access to intracellular sites of action, and a number of studies have suggested mitochondria as targets for cannabinoids (Bartova and Birmingham, 1976; Sarafian et al., 2003; Athanasiou et al., 2007). Modulation of [Ca2+]i by CBD has also been observed in a variety of cell types (Ligresti et al., 2006; Giudice et al., 2007), including our previous work which demonstrated a CBD-induced non-CB1/TRPV1-receptor-mediated increase in [Ca2+]i in hippocampal neurons (Drysdale et al., 2006). Subsequent studies showed CBD effects to be negatively modulated by the endocannabinoid system (Ryan et al., 2007), but the exact mechanisms remained to be fully characterized. Therefore, the present study investigated CBD actions upon mitochondria and Ca2+ homeostasis as a potential basis for CBD's neuroprotective properties. Preparation of standard primary hippocampal cultures from Lister–Hooded rat pups (1–3 d old) was conducted as described previously (Drysdale et al., 2006; Ryan et al., 2006), conforming to Home Office and institute regulations. Briefly, pups were killed by cervical dislocation and the brain removed, and the hippocampi were dissected out and placed in filtered ice-cold HEPES-buffered solution (HBS, composition in mm: NaCl, 130; KCl, 5.4; CaCl2, 1.8; MgCl2, 1; HEPES, 10; glucose, 25; compounds from Sigma-Aldrich). Hippocampal tissue was finely chopped and placed in a 1 mg/ml protease solution (type X and XIV, Sigma-Aldrich) for 40 min. Graded fire-polished glass Pasteur pipettes were used to triturate the tissue a number of times. Following centrifugations, the tissue pellet was resuspended in tissue culture medium [90% minimum essential medium (MEM; Invitrogen), 10% fetal bovine serum (FBS) (Helena Biosciences), and 2 mm l-glutamine (Sigma-Aldrich)], kept in a humidified incubator at 37°C and in 5% CO2, and plated in 35 mm culture dishes (Invitrogen, coated with poly-l-lysine, Sigma-Aldrich). After 1 h, an additional 2 ml of tissue culture medium was gently added to each dish and stored in a humidified incubator (37°C; 5% CO2). After 2 d of maturation, the MEM was replaced with Neurobasal medium (Invitrogen) to reduce glial growth [composition of culture by cell-type (2:1, neurons:glia) was in keeping with that outlined in previous publications (Platt et al., 2007)], containing 2% B27, 2 mm l-glutamine, and 25 μm l-glutamate (Sigma-Aldrich). Culture dishes were checked for uniform density and deemed suitable for imaging experiments from 5 to 10 d in vitro based on fully reproducible NMDA responses (variability: <5%), with control experiments conducted at regular intervals. For calcium imaging experiments (see also Ryan et al., 2006), hippocampal cultures were washed with HBS (as above) at room temperature and loaded with the cell-permeable fluorescent calcium indicator fura-2 AM (10 μm, Invitrogen) for 1 h in the dark. To allow the monitoring of postsynaptic events uncontaminated by spontaneous activity and transmitter release, the sodium channel blocker tetrodotoxin (TTX, 0.5 μm, Alomone Labs) was added to all perfusion media (except in experiments with 4AP). Cultures were perfused with HBS or low-Mg2+ (0.1 mm) HBS, using a gravity perfusion system at a flow rate of 1–2 ml/min. The imaging system, fitted onto an Olympus BX51WI fixed stage microscope, used the Improvision software package Openlab (version 4.03, Improvision) with a DG-4 illumination system (Sutter Instruments) and a Hamamatsu Orca-ER CCD camera for ratiometric imaging. After an appropriate field of cells was identified, a gray-scale transmission image was visualized and captured. Cells were excited with wavelengths of 340 and 380 nm, and the ratio of fluorescence emitted at 510 nm analyzed after subtraction of background fluorescence levels. As described in our previous publications, fields of cells and regions of interest (ROIs) were chosen based on homogenous and equal cell densities, with a neuronal population of 15–40 cells per field of view. ROIs were placed on all fura-2 AM-loaded neuronal cell bodies and large, star-shaped glia, confirmed to be astrocytes by GFAP staining, and based on an overlay of a transmission image (Koss et al., 2007). Following this, time courses were created for all cells (neurons and glia), with frames captured every 5 s.
The mitochondrial and cytosolic Ca2+ compartments were visualized simultaneously by preloading cultures with the mitochondrion-specific Ca2+ sensor Rhod-FF, AM (Invitrogen). Culture dishes were incubated with Rhod-FF, AM (5 μm, in standard HBS) for 15 min on the day before experimentation to allow compartmentalization of the marker (specificity of this marker was confirmed by the abolition of compartmentalization by FCCP application) (see Fig. 4Ci,Cii). HBS was replaced with fresh Neurobasal medium and returned to the incubator overnight. The following day, cells were loaded with fura-2 AM as described above. Dual imaging was performed with alternating wavelengths relevant to Rhod-FF (excitation: 550 nm; emission: 580 nm) and fura-2 AM (as above) delivered at intervals of 3 s. Both images were background subtracted, and separate graphs were plotted on-line (see Fig. 4). For off-line analysis of mitochondrial responses, data were imported into the Volocity analysis program (version 4.02, Improvision). Areas of most intense Rhod-FF mitochondrial fluorescence within a single neuron were allocated ROIs. 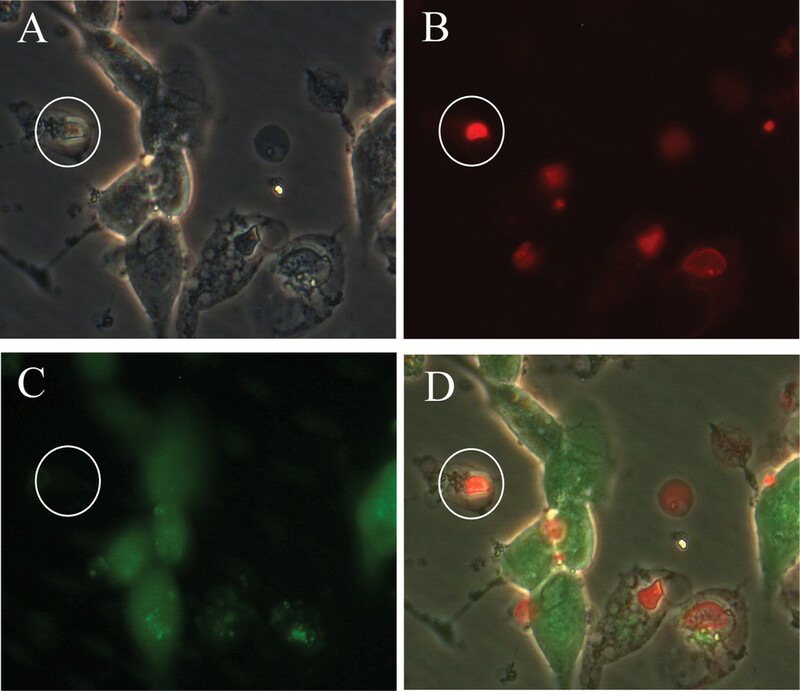 The established human neuroblastoma cell line, SHSY-5Y (SH), was grown in 30 ml flasks in MEM-based medium supplemented with growth factor F12, 10% fetal bovine serum, 2 mm l-glutamine, and 50 μg/ml antibiotic. Cells were maintained at 37°C at 5% CO2. Medium was replaced every 2–4 d, after washing with PBS (1 mm phosphate). Once cells proliferated to ≥80% confluency they were passaged or transferred to a 96-well plate (Greiner) for experimental treatment (final volume in medium: 150 μl of cell suspension per well). Plates were used for experimentation when ≥80% confluency was achieved (typically taking 4 d). Each treatment and relevant vehicle controls were run in six samples (wells) per experiment and repeated at least twice, viability was compared using the nontoxic cell viability marker Alamar Blue (Serotec). This marker was made up as a 10% solution in MEM and applied to all wells (following the removal of treatment medium) for 2 h at 37°C, 5% CO2. The plates were then run in a plate reader (either Victor2 1420, Wallac, Perkin-Elmer or Synergy HT, Bio-Tek) and the fluorescence (excitation: 530 nm and emission: 590 nm) measured. Cell death in hippocampal cultures. Hippocampal cultures were preincubated with CBD for 1 h before coapplication of CBD with mitochondrion-acting toxins overnight, following which cell death was quantified using a Live-Dead staining kit (Sigma) (modified from our previous publications) (Platt et al., 2007). Briefly, 10 μl of solution A and 4 μl of solution B were diluted in 5 ml of HBS (at room temperature). Each dish was washed in HBS three times and 500 μl of the staining solution added and incubated for 20 min (in the dark, at room temperature). After a further wash with HBS, live images were capture in HBS with a 40× phase-contrast water-immersion objective [brightfield, FITC (live cells) and rhodamine filters (dead cells)] using an Axioskop 2 plus microscope (Carl Zeiss) fitted with an AxioCam HRc camera, with AxioVision software (version 3.1). Three images were taken from each dish and each experiment performed on at least two dishes from three different cultures. SH-SY5Y cells were grown on 96-well plates and treated with FCCP overnight as described above. MitoCapture reagent (Calbiochem) was diluted 1:1000 in PBS (at room temperature) before use. The medium was removed from the wells of the plate and replaced with 50 μl of reagent solution and placed in an incubator (37°C at 5% CO2) for 15–20 min. The cells were then washed twice with PBS and run through the plate reader (Synergy HT, Bio-Tek) with two fluorescence channels measured (green monomers: excitation 488 nm and emission 530 nm; red aggregates: excitation 488 nm and emission 590 nm). Control and toxin groups were run in 6 samples (wells) per experiment and performed three times. CBD, obtained from GW Pharmaceuticals, and AM281 (Tocris Bioscience) were stored in ethanol (1 mg/ml) at −20°C. For use in experiments, the ethanol was evaporated and the cannabinoid resuspended in dimethyl sulfoxide (DMSO) at 1 mm (control experiments confirmed that 0.1% DMSO did not alter basal Ca2+ levels or NMDA-induced Ca2+ responses, data not shown). The toxins tested in the SH-SY5Y model were as follows: hydrogen peroxide (H2O2, Sigma-Aldrich) at 0.1 and 0.5 mm, 3 h application; oligomycin (20 μm, Sigma-Aldrich) applied overnight (used in the same manner in hippocampal culture cell death models also); FCCP (Sigma-Aldrich) was also applied overnight at 20 μm (also applied in the same concentration and duration in hippocampal culture cell death models). In each case, pilot experiments were performed to determine suitable concentrations resulting in a degree of cell death that leaves capacity for either a reduction or increase in cell viability (targeted reduction in cell viability: 40–70%). The sites of action of these toxins can be seen in Figure 1. Other compounds tested to elucidate CBD's mechanisms of action were (with final concentrations and stock solvents listed) as follows: catalase (500 and 1000 U/ml; MEM), cyclosporin A (CsA; 1–20 μm; DMSO), butylated hydroxytoluene (BHT; 3 and 10 μm; DMSO), and dantrolene (10 μm; H2O), all from Sigma-Aldrich. Additionally, 4-aminopyridine (4AP; 50 μm; DMSO), 2-aminoethoxydiphenyl borate (2-APB; 100 μm; DMSO), and CGP 37157 (10 μm; DMSO) were obtained from Tocris Bioscience. For all compounds tested, drug-only controls were performed. All fura-2 AM fluorescence values were converted into %ΔF/F, where ΔF is the change in fluorescence, calculated as a percentage of baseline fluorescence (F), which was defined as an average of five baseline values before drug application (Drysdale et al., 2006; Ryan et al., 2007). Each group of experiments consisted of at least three independent replications from different cultures. A change in fluorescence of ≥10% of baseline fluorescence was deemed a genuine response to drug applications (with intrinsic Ca2+ fluctuations ± 5%). Data were exported to Excel and GraphPad Prism (version 4, Graph Pad Software) for preparation of graphs and statistical analysis. Due to the absence of normal distribution, Kruskal–Wallis nonparametric tests with Dunn's post hoc test were used for multiple-group comparisons, and a Mann–Whitney U test applied for paired comparisons. For work with SH cells, data generated as units of fluorescence intensity were transferred to Excel and converted into percentage of within-plate controls for graphical presentation only. Statistical analysis was performed on raw data using Prism, with an overall one-way ANOVA performed for multiple-group comparison. For overall p values <0.05, Tukey's posttest was used for paired comparison. Comparison of two relevant groups was conducted using an unpaired t test. Significance for all statistical analyses performed was set at p < 0.05 = significant; p < 0.01 = highly significant; p < 0.001 = very highly significant. Previous studies from our group have strongly suggested a link between CBD signaling and [Ca2+]i regulation via intracellular Ca2+ stores (Drysdale et al., 2006; Ryan et al., 2007). To explore and characterize the underlying mechanisms, experimental conditions were used which enhance excitability and increase the degree of loading of intracellular Ca2+ stores. It was predicted that such conditions should increase the CBD response compared with responses in standard HBS (Fig. 2A), as reported for other store-operated signaling cascades (Irving and Collingridge, 1998). Thus, CBD was applied (1 μm; 5 min) in HBS with doubled K+ concentration (10.8 mm). Surprisingly, under these conditions the effect of CBD application was to reduce [Ca2+]i in both neurons and glia (Fig. 1B). The neuronal response was −26 ± 2% ΔF/F (n = 19), with almost identical responses in glia [−26 ± 4% ΔF/F (n = 19)], p values <0.001 compared with CBD controls (Fig. 1C), suggesting that [Ca2+]i regulation by CBD is bidirectional and depends on excitability. Mitochondrial components of Ca2+ regulation and targets for drug action used to assess the action of CBD. Drugs/enzymes used to induce cell death in SH-SY5Y cells are italic and underlined, and those applied to identify possible mechanisms of protection are outlined. SOD2, Superoxide dismutase 2. Bidirectional Ca2+ responses to CBD in hippocampal cultures. A, B, Sample traces for CBD-mediated Ca2+ responses in neurons (black traces) and glia (gray traces) in normal (A) and high-excitability (B) HBS (double K+ concentration). NMDA applications at the end of each experiment were used to confirm intact signaling in neurons. C, Mean responses of CBD in normal (ctrl) and high (high ex)-excitability HBS. Data are presented as %ΔF/F + SEM. ***p < 0.001. In an alternative approach, we induced seizure-like Ca2+ oscillations by applying the K+ channel blocker 4AP, thus also probing previously reported anti-convulsant actions of CBD. Here, 4AP (50 μm) applied to primary hippocampal cultures (Fig. 3A) induced a sustained rise in [Ca2+]i that continued to cause Ca2+ oscillations a few minutes after wash. When the 4AP application was immediately followed by 1 μm CBD (Fig. 3B), oscillations were silenced (n = 29; 5 glia, 24 neurons). Alternating the order of application robustly demonstrated that CBD could also prevent the initiation of epileptiform activity by 4AP. This was proven to be the case in all neurons (n = 10) and almost all glia (n = 30/31) investigated (Fig. 3C). CBD effects on epileptiform activity in cultured hippocampal neurons. A, Application of the K+ channel antagonist 4AP to naive cultures induces spontaneous Ca2+ oscillations. B, C, The presence of CBD following (B), or preceding (C), 4AP application dampened Ca2+ oscillations. Data are presented as %ΔF/F. Previous work from our laboratory indicated a link between CBD-induced Ca2+ responses and intracellular Ca2+ stores (Drysdale et al., 2006), rather than extracellular Ca2+ sources. Thus, we next investigated a potential role of mitochondria, fundamental players in cellular Ca2+ homeostasis, in CBD's action. To simultaneously study mitochondrial signaling together with cytosolic Ca2+ responses, cultures were preloaded with the mitochondrion-specific Ca2+-sensitive fluorescent marker, Rhod-FF, AM, followed by fura-2 AM loading (Fig. 4). 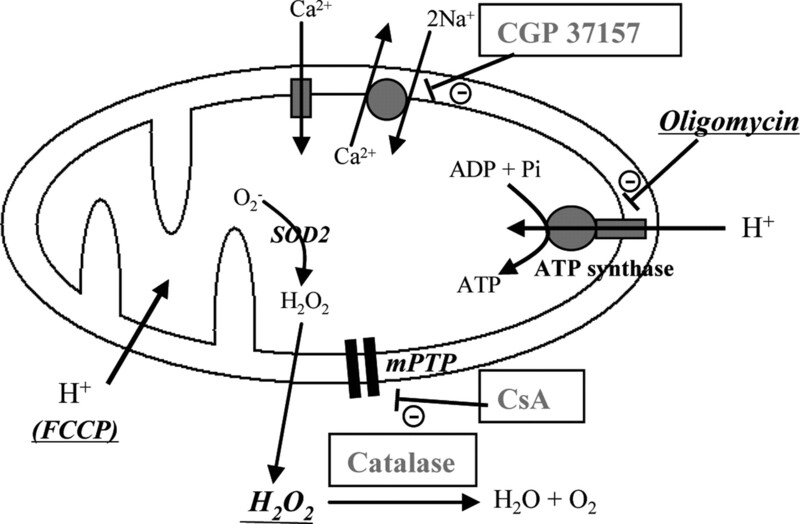 The fluorescence pattern and responses to FCCP (10 μm), an uncoupler of ATP synthesis due to its action as a protonophore, confirmed the specificity of this protocol, causing leakage of mitochondrial Ca2+ from mitochondria accompanied by an increased cytosolic Ca2+ concentration (Fig. 4). Application of CBD (1 μm) resulted in an increase in cytosolic Ca2+, preceded by a response in the Rhod-FF fluorescence (Fig. 5). Two Rhod-FF response patterns were observed, biphasic (an initial rise followed by a decrease) or a continuous decline (see sample traces given in Fig. 5A,B). Subsequently, we confirmed that the pattern observed with CBD in this dual-fluorescence model genuinely represents a release from mitochondrial Ca2+ stores by preapplication of FCCP (1 μm), applied to dual-loaded cultures (see Fig. 1 for the sites of action for this and other mitochondrion-acting compounds). 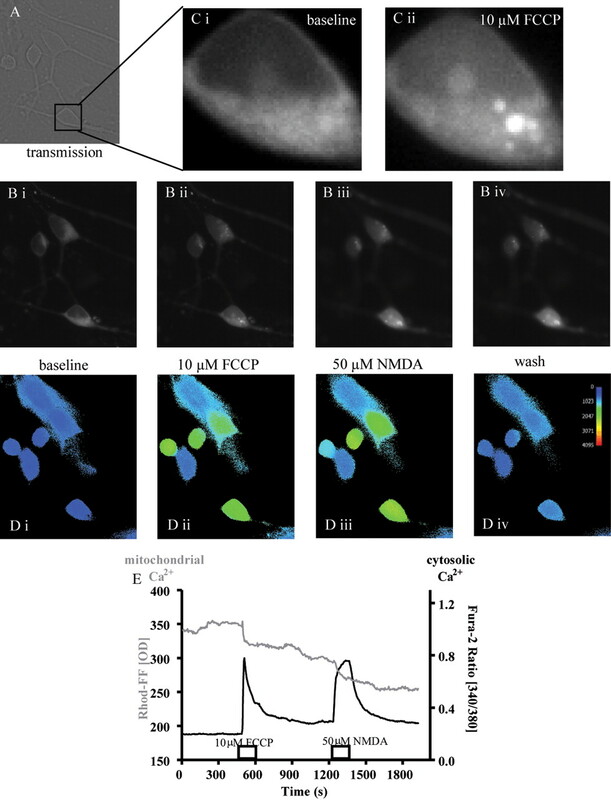 At this concentration, FCCP induced an immediate reduction in Rhod-FF fluorescence in the mitochondrial compartment, and somewhat delayed in onset and progression, an increase in cytosolic Ca2+ levels was observed. More importantly, no further responses to CBD could be induced in mitochondria (Fig. 5C), while raised cytosolic Ca2+ levels recovered partially, in agreement with our previous experiments in high-K+ HBS and 4AP. Dual-loading of hippocampal cultures with fura-2 AM and Rhod-FF, AM. A, Typical transmission image shows clearly defined neuronal appearance. B, C, Rhod-FF fluorescence (B) demonstrates a clear compartmentalization into mitochondria, a pattern disrupted by FCCP application (Ci, Cii). The corresponding cytosolic Ca2+ alterations are monitored using fura-2 AM (D) with responses shown in both compartments to the mitochondrial uncoupler FCCP and NMDA (B, Di–Div). E, The raw values (OD, optical density) for each channel are plotted. Mitochondrial and cytosolic CBD (1 μm) responses in naive cultures loaded with Rhod-FF, AM and fura-2 AM. A, B, Sample traces from neurons showing delayed cytosolic (black trace) and early biphasic mitochondrial (gray trace) Ca2+ responses. NMDA application was used as an indicator of neuronal viability and to make a clear distinction between neurons and glia. C, Application of FCCP (1 μm) led to a drop in mitochondrial Ca2+ levels and prevented a further Ca2+ rise by CBD. Vertical lines have been added to visualize the order of responses. All Rhod-FF data are raw fluorescence values (OD, optic density), and fura-2 AM responses are presented as ratio values. 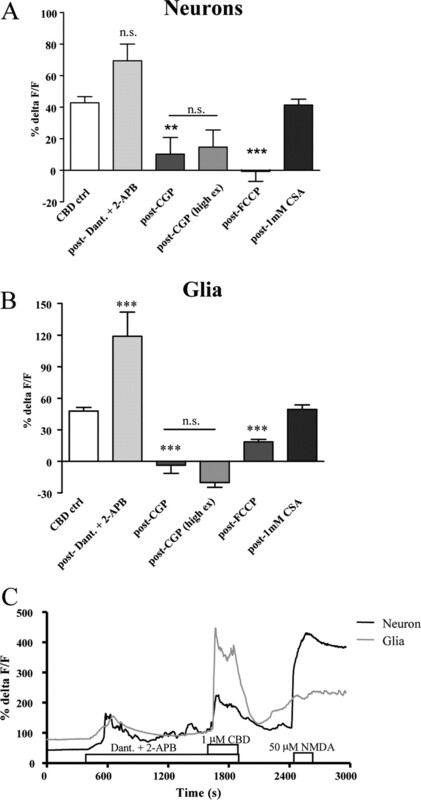 Overall, FCCP eradicated CBD responses in neurons [mean: −1 ± 6% ΔF/F (n = 25), p < 0.001 compared with controls] and significantly reduced responses in glia [reduced by 61 ± 5% (n = 8), p < 0.001]. As these data strongly suggested a mitochondrial site of action, we aimed to exclude the ER as the primary source of Ca2+ for CBD responses by applying CBD in the presence of specific antagonists to the receptors linked to Ca2+ release pathways from the ER (dantrolene and 2-APB, acting as ryanodine and IP3 receptor antagonists, respectively). The blockade of one of these receptors has been shown to upregulate the activity of the other, implying that both release mechanisms share a common pool of Ca2+ (White and McGeown, 2003). Thus, both antagonists were coapplied to fully block ER receptor-mediated release. Such a blockade transiently altered baseline Ca2+ levels, but longer duration of antagonist treatment (10 min) allowed a settled baseline to be established before CBD application. When CBD was coapplied with 2-APB and dantrolene, responses did not significantly differ from control values (p > 0.05), with glial responses increased compared with controls (p < 0.001) (Fig. 6), further confirming that ER receptors are somewhat modulating, but not mediating CBD-induced responses. Effects of ER- and mitochondrion-acting drugs on CBD responses. A, B, The role of mitochondria in CBD responses were confirmed in neurons (A) and glia (B). The uncoupler FCCP prevented neuronal CBD response and largely reduce glial responses while blockade of IP3 and ryanodine receptors [by 2-APB and dantrolene (Dant. ), respectively] did not significantly alter CBD responses in neurons, a sample trace of which is also shown (C). In the presence of CGP 37157 (CGP), but not in the presence of the mPTP inhibitor cyclosporin A (CsA), CBD responses were also blocked in normal and high-excitability HBS; CBD responses under high-excitability conditions no longer differed from standard HBS responses. Data are presented as %ΔF/F + SEM; n.s., not statistically significant; **p < 0.01, ***p < 0.001. Thus, our data strongly suggested that [Ca2+]i regulation via CBD is achieved via mitochondrial uptake and release, which could potentially be achieved via either the mPTP or the mitochondrial Na+/Ca2+-exchanger (NCX) (Griffiths, 1999). Experiments with the mPTP inhibitor CsA showed no difference to control CBD responses, implying that the mPTP is not the principal mechanism of CBD's actions (Fig. 6). When the role of the NCX in CBD-mediated responses was investigated using the specific antagonist CGP 37157 (CGP) (Chiesi et al., 1988; Medvedeva et al., 2008), preapplied and coapplied (10 μm), CBD (1 μm) responses were abolished [remaining response: neurons: 10 ± 10% ΔF/F (n = 8), glia: 3 ± 7% ΔF/F (n = 14), p values <0.001] (Fig. 6). To confirm that NCX was also fundamental to [Ca2+]i reducing CBD responses, the experiment was repeated in the presence of elevated [K+]e (as above). The reversal of neuronal CBD responses normally seen under these conditions was no longer observed. Accordingly, the CBD response in CGP no longer differed between high-K+ and standard HBS in both neurons and glia (p values >0.05) (Fig. 6). Therefore, we conclude that CBD is acting via the mitochondrial NCX to elevate or decrease cytosolic Ca2+ levels, dependent on resting [Ca2+]i. The apparent mitochondrial site of action of CBD led to the hypothesis that CBD may act as a neuroprotectant against mitochondrially acting toxins, acting either directly on mitochondrial sites or downstream thereof (Fig. 1). Initial tests used the mitochondria-reliant viability assay Alamar Blue in SH-SY5Y cells, with protective actions of CBD confirmed in hippocampal cultures using a live–dead stain (Fig. 7). Determination of cell death in hippocampal cultured neurons (live–dead cell staining kit) by multichannel image capture in cells treated with 20 μm oligomycin. A, Transmission image. B, Cells with compromised cell membranes (rhodamine filter). C, Healthy cells (FITC filter). D, Merged image. A dead sample neuron is circled in each image. For further details, see Materials and Methods. Application of hydrogen peroxide (H2O2), produced in response to cell stress and metabolic impairment as a byproduct of the dismutation of the superoxide (O2−) free radical, to SH cells at 100 μm for 3 h reduced cell viability by ∼50% (range: 40–60%). As a positive control for the mode of cell death, the peroxide-specific catalyzing enzyme catalase was coapplied. With and without 1 h preapplication, catalase (at both 500 and 1000 U/ml) fully protected against peroxide-induced cell death. Next, CBD (0.1 and 1 μm) was assessed as a potential neuroprotectant and was initially coapplied with H2O2. The lower concentration of CBD proved to be marginally, though significantly, protective (by 16 ± 5% (n = 18); p < 0.05), whereas the higher concentration had no significant effect (Fig. 8A). This experiment was repeated with cells preexposed to CBD (concentrations as above) for 1 h before H2O2 exposure. The neuroprotective effects of 100 nm CBD were no longer evident, while 1 μm CBD worsened the fate of cells (p < 0.05, compared with peroxide controls). Overall, this pattern argues against a simple antioxidant action of CBD. Cannabinoids as potential neuroprotectants against mitochondrial stressors in SH-SY5Y cells. Data are expressed as percentage protection (+SEM) relative to within-experiment controls and shown for peroxide (0.1 mm) (A) and oligomycin (20 μm) (B) toxicity. CBD conferred protection against oligomycin toxicity in both SH-SY5Y cells and hippocampal cultures (HIPP.). Pre-Inc., Following 1 h preincubation; *p < 0.05, ***p < 0.001. Next, ATP production was targeted with oligomycin, an inhibitor of ATP synthase (Fig. 1) that blocks the phosphorylation of ADP at this complex of the electron transport chain (Penefsky, 1985; Duchen, 2004). Following overnight dose–response experiments, a concentration of 20 μm was selected for further experimentation (average reduction in cell viability: 35%). A modest, though significant, protection was conferred by coapplication of the toxin with 1 μm CBD [improved by 15 ± 4% (n = 23), p < 0.05] (Fig. 8B), but not with the lower CBD concentration (100 nm, data not shown). As a confirmation of mPTP involvement in this toxicity assay, the inhibitor of mPTP formation, CsA (1 μm), was applied and proved to be protective [increase in cell viability: 53 ± 10% (n = 24), p < 0.001 compared with oligomycin controls]. In comparison, catalase conferred no protection against oligomycin toxicity, coapplication of CsA and CBD also proved not to be additive (data not shown). Notably, CsA alone (in the absence of any toxin) improved cell viability (CsA control being 110 ± 3% of control value, p < 0.05), implying under resting conditions there may be some activation of mPTP (data not shown). Neuroprotection of CBD was also confirmed in hippocampal cultures, where CBD (with 1 h preincubation) again proved to be neuroprotective by 31 ± 3% (n = 9, p < 0.01) (Fig. 8B). Finally, as a continuation of our imaging data, CBD was again tested in combination with the uncoupler of ATP synthesis, FCCP (see above and Fig. 1). To further confirm the mitochondrial site of action of FCCP, SH-SY5Y cells were loaded with the MitoCapture fluorescent dye, also used as a marker for apoptosis. In healthy cells, the reagent congregates in the mitochondria and is detected as a red fluorescence signal. Conversely, in apoptotic cells, MitoCapture remains in the cell cytosol (due to the disrupted mitochondrial membrane potential) and can be monitored as a green fluorescent signal. Following FCCP incubation (20 μm, overnight) green fluorescence was increased by 45 ± 8%, while red fluorescence was decreased by 51 ± 6% (in both cases n = 30 and p < 0.001 compared with controls) (Fig. 9C). This indicates that FCCP is acting to primarily depolarize mitochondria. 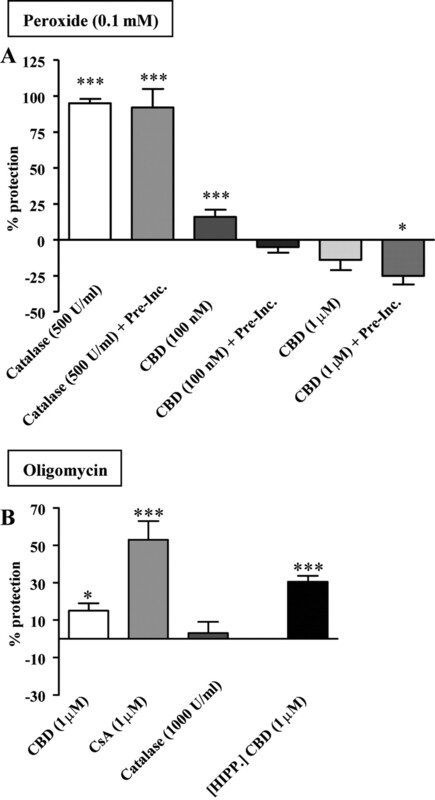 Effects of CBD and other potential neuroprotectants against toxicity induced by the mitochondrial uncoupler FCCP in SH-SY5Y cells. A, The phytocannabinoid CBD is neuroprotective with and without preincubation (Pre-inc.), although protection was enhanced when CBD was present before FCCP was applied. Such neuroprotection was similarly observed in hippocampal cultures (HIPP.) Maximal protection with CBD was comparable to that observed with cyclosporin A (CsA). B, Comparison of antioxidant effects of CBD and butylated hydroxytoluene (BHT). Note the apparent synergism between these two compounds, achieving full (100%) protection. C, Confirmation of FCCP's actions to disrupt mitochondrial potential was obtained using MitoCapture, demonstrating both a reduced number of healthy cells (red signal) and increased number of cells with disrupted mitochondrial potential (green signal) in the presence of FCCP. Data are presented relative to controls (+SEM). *p < 0.05, ***p < 0.001; n.s., not statistically significant. The Alamar Blue assay indicated that 20 μm FCCP (overnight) caused a mean reduction in cell viability of 70 ± 2%. When CBD (100 nm and 1 μm) was coapplied with FCCP it was neuroprotective at both concentrations [percentage protection: 10% and 15%, respectively, n = 12 for both (p < 0.01)] (Fig. 9A), in line with the evidence from previous acute imaging experiments. This experiment was next repeated with the cells exposed to CBD for 1 h before FCCP application. A markedly enhanced protection was observed (100 nm CBD yielding 35 ± 3% protection and 1 μm conferring 53 ± 2% protection). This level of protection was significantly greater than that seen without CBD preexposure in each case (p values <0.05). CsA was also found to be protective in this model in a dose-dependent manner, reaching maximal protection (43 ± 2%, n = 24, p < 0.001) at 20 μm (shown in Fig. 9A). As for oligomycin, when the FCCP toxicity experiment was repeated in cultured hippocampal neurons (with 1 h CBD preincubation), CBD proved to be protective by 27 ± 3% (n = 6, p < 0.01) (Fig. 9A). Since an antioxidant capacity has been widely reported for CBD (Hampson et al., 1998; Chen and Buck, 2000), its neuroprotective properties were subsequently compared with the protective capabilities of the free radical scavenger butylated hydroxytoluene (BHT). Interestingly, coapplication of FCCP with BHT (at 3 and 10 μm; n values = 11 and 12, respectively) conferred no significant protection (p values >0.05), yet joint application of CBD (1 μm) applied with the higher concentration of BHT (10 μm) provided a complete prevention of FCCP's toxic effects [100 ± 7% protection (n = 12), p < 0.001 compared with FCCP controls], significantly more potent than CBD alone (p < 0.001) (Fig. 9B). The superadditive nature of this protection strongly suggests independent but synergistic modes of action. Overall, our data suggest that CBD directly acts on mitochondria, and this action offers protection against toxins that directly target mitochondria. We here report bidirectional regulation of [Ca2+]i and protection provided by CBD. This was evident acutely as CBD reduced cytosolic Ca2+ levels in high-K+ solution, and also silenced and prevented epileptiform-like activity induced by 4AP. The latter experiments were performed in the absence of TTX (as sustained spontaneous firing and neurotransmitter release is fundamental for epileptiform activity), hence one possibility is that anticonvulsant activity could be mediated by actions on transmitter release, a property already identified for a number of cannabinoids with respect to glutamate (Szabo and Schlicker, 2005; Shen et al., 1996) and GABA (Katona et al., 1999; Köfalvi et al., 2005). Such actions can potentially alter excitability but would require CBD to act on the endocannabinoid system. While modulatory interactions between CBD and endocannabinoids were demonstrated in our previous work (Ryan et al., 2007), this did not involve agonism on known CB receptors, although an indirect action on these receptors via inhibition of endocannabinoid reuptake and hydrolysis remains a possibility (Bisogno et al., 2001; Ligresti et al., 2006). A number of other studies have identified CBD as an anti-epileptic agent both in vitro and in vivo (for review, see Pertwee, 2004), and our data imply that this can be achieved by a mitochondrial regulation of [Ca2+]i. We also propose that this action would offer beneficial protection in disease states that involve hyperexcitability, as CBD's mode of action may allow it to functioning as a Ca2+ sensor and regulator. The reversal of Ca2+ responses in hippocampal cultures in the presence of an already elevated [Ca2+]i (as a result of increased K+ in the perfusion media) ruled out the ER receptors as the primary source of Ca2+ in CBD responses, but instead echoed the theory of the mitochondrial Ca2+“set point” (Nicholls, 2005), i.e., the cytosolic concentration of Ca2+ at which mitochondrial uptake and efflux of Ca2+ are equal: interactions between Ca2+ influx and efflux mechanisms in the mitochondria maintain extramitochondrial Ca2+ concentrations at a fixed value (Nicholls, 1978; Thayer and Miller, 1990). Therefore, the opposing CBD responses may be achieved via reversal of one and the same Ca2+ transport mechanism (see also Poburko et al., 2006). Additionally, the ER as the principal source of Ca2+ released by CBD was effectively discounted by the combined application of dantrolene and 2-APB, which did not prevent CBD responses. 2-APB blocks sites other than IP3 receptors, including TRP channels (for review, see Bootman et al., 2002), a subset of which can act as Ca2+ release channels from the ER. This is an important consideration, as phytocannabinoids can raise Ca2+ via these channels (De Petrocellis et al., 2008), yet a contribution to the CBD response in our experiments is unlikely as suggested by our data obtained with 2-APB (Fig. 6) (see also Tsuzuki et al., 2004). Instead, the trend of increased CBD responses in the presence of 2-APB is in agreement with similarly enhancing actions observed with TRPV1 and CB1 antagonists (Ryan et al., 2007). The ER is a fundamental player in Ca2+ homeostasis with perturbations of this organelle's functioning associated with excitotoxicity (e.g., in Alzheimer's disease) (for review, see Mattson and Chan, 2003). Moreover, the close interaction between ER and mitochondrial Ca2+ signaling is an important factor in apoptotic signaling (for review, see Szabadkai and Rizzuto, 2004), although a recent study has suggested mitochondrial regulation of cytosolic Ca2+ independent of the ER, with the NCX as the rate-limiting factor for temporal decoding (Young et al., 2008). A direct role for mitochondria in CBD signaling was confirmed here by the use of dual-loaded hippocampal neurons with Ca2+-sensitive probes for mitochondrial and cytosolic compartments, with changes in mitochondrial Ca2+ levels preceding the rise of cytosolic Ca2+. Moreover, the depletion of Ca2+ from mitochondria (using FCCP) resulted in the inability of CBD to yield any subsequent response. CBD's point of action upon mitochondria was identified to be the NCX (and not the mPTP), as CBD responses were no longer present when this exchanger was blocked by CGP, yet unaffected by CsA. The NCX functions normally to remove Ca2+ from the mitochondria but can reverse when the ionic gradients are sufficiently altered, especially in disease states (Jung et al., 1995; Griffiths, 1999; Poburko et al., 2006). A fundamental role for the mitochondrial NCX in Ca2+ signaling associated with ischemia and excitotoxic events, where the influx of Na+ into the cell causes release of Ca2+ from mitochondria, has previously been identified in hippocampal tissue (Zhang and Lipton, 1999). CGP may act not only upon mitochondrial NCX, but also as an inhibitor of VGCCs in dorsal root ganglion neurons (Baron and Thayer, 1997). However, our previous data with VGCC blockers (Drysdale et al., 2006) are not consistent with an effect of CBD on this target. Others have found CGP to inhibit the NCX in the plasma membrane of cerebellar granule cells (Czyz and Kiedrowski, 2003), although with an IC50 of 13 μm, a concentration higher than that used here, and higher than CGP's IC50 (4 μm) for the mitochondrial NCX in cultured rat DRGs (Baron and Thayer, 1997). Indeed, the concentration of CGP used here is in keeping with recent work by others in cultured neurons (Medvedeva et al., 2008). Our study uncovers a new intracellular, and potentially direct, target for CBD, which has so far been largely elusive despite the wide-ranging use of this phytocannabinoid in diverse preparations and applications. Evidence for actions of CBD on mitochondria was strongly supported by cell death models with mitochondrial toxins. The most potent CBD protection was seen against FCCP toxicity (in SH cells and reproduced in cultured hippocampal neurons), a mitochondrial uncoupler, causing the collapse of the mitochondrial membrane potential and the release of Ca2+ into the cytosol. A more modest protection by CBD was observed against other oxidative stress related agents, hydrogen peroxide and oligomycin. FCCP causes the accumulation of protons into mitochondria leading to uncoupling of the mitochondrial potential (ΔΨm), ultimately causing a loss of ATP production (for review, see Wallace and Starkov, 2000), and has previously been demonstrated to cause apoptosis in PC12 cells (Dispersyn et al., 1999) and primary neurons (Moon et al., 2005). The loss of ΔΨm (confirmed by MitoCapture) and resultant cell death is also assumed to involve mPTP formation (Marques-Santos et al., 2006), in keeping with our finding that CsA can protect against FCCP toxicity in a dose-dependent manner. Exogenous application of hydrogen peroxide (as well as the cellular generation of this oxidative agent) has been shown to induce apoptosis in association with MAP kinase activation (Guyton et al., 1996). Thus, CBD's neuroprotective action against H2O2 toxicity in SH cells is in line with CBD's reported inhibition of p38 MAP kinase, although proposed to be secondary to CBD's antioxidant capacity (El-Remessy et al., 2006), which was not apparent here. Ligresti et al. (2006) also showed protection in breast cancer cells against H2O2 toxicity at low (nm) but not higher (μm) concentrations of CBD. The latter effect was suggested to involve the generation of ROS, also reported in glioma cells (Massi et al., 2006). Therefore, the possibility has been raised that CBD might have potential as an anticancer treatment (for review, see Mechoulam et al., 2007). A comparison between the antioxidant properties of CBD and BHT has been performed previously (Hamelink et al., 2005), with approximately equivalent antioxidant capacities reported for both compounds. This is surprising in the light of the data generated here where CBD, but not BHT, alone was neuroprotective against FCCP toxicity. 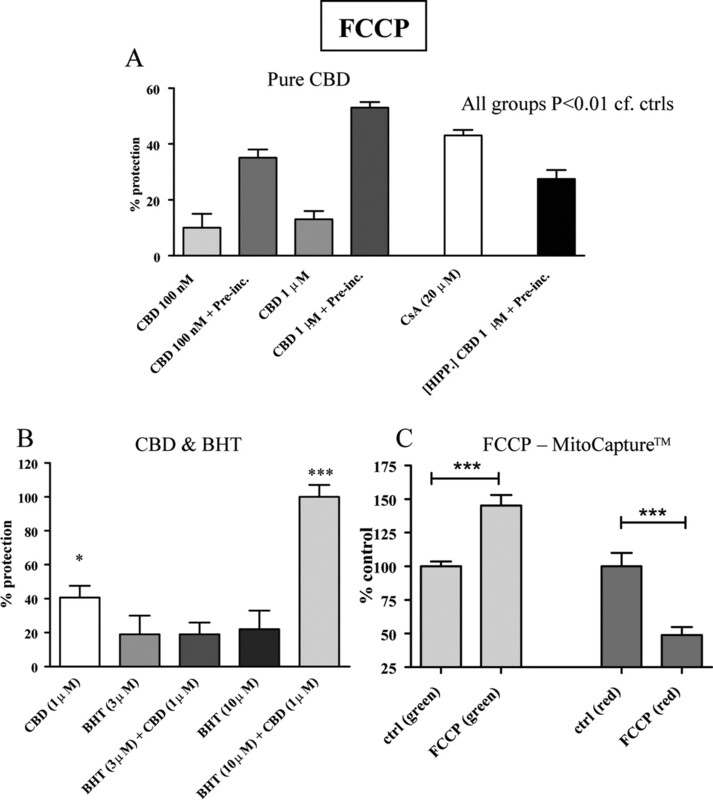 Interestingly, the combination of CBD and BHT caused complete protection against FCCP. Previous work conducted in our lab has shown an interaction between this phytocannabinoid and BHT, with BHT preexposure (saturating antioxidant pathways) to primary rat hippocampal cultures facilitating [Ca2+]i responses to a subsequent CBD application (our unpublished observations). This implies a synergy between CBD and antioxidant pathways, with the latter facilitating CBD's effects, rather than mediating them. Since CBD showed only little protection in the peroxide model, it seems that its anti-oxidant properties are not of major relevance for its protective action. While similar protection was seen for CsA and CBD in the FCCP model, differences in efficacy between CsA and CBD and the lack of additivity between CBD and CsA in the oligomycin model (Comelli et al., 2003) suggest that the mPTP is not a major target in CBD's action. Overall, the apparent capacity for CBD to reduce [Ca2+]i when it is abnormally elevated via interactions with mitochondria-dependent Ca2+ regulation may be a valuable property for many disease states associated with Ca2+ dysregulation. Moreover, neurodegenerative diseases linked directly to mitochondrial malfunction, such as Huntington's disease and Friedreich's ataxia, may benefit greatly from CBD-based medicines. We thank GW Pharmaceuticals for the provision of CBD. (2007) Cannabinoid receptor agonists are mitochondrial inhibitors: a unified hypothesis of how cannabinoids modulate mitochondrial function and induce cell death. Biochem Biophys Res Commun 364:131–137. (1997) CGP37157 modulates mitochondrial Ca2+ homeostasis in cultured rat dorsal root ganglion neurons. Eur J Pharmacol 340:295–300. (1976) Effect of delta9-tetrahydrocannabinol on mitochondrial NADH-oxidase activity. J Biol Chem 251:5002–5006. (2001) Molecular targets for cannabidiol and its synthetic analogues: effect on vanilloid VR1 receptors and on the cellular uptake and enzymatic hydrolysis of anandamide. Br J Pharmacol 134:845–852. (2002) 2-Aminoethoxydiphenyl borate (2-APB) is a reliable blocker of store-operated Ca2+ entry but an inconsistent inhibitor of InsP3-induced Ca2+ release. FASEB J 16:1145–1150. (1993) Age-dependent impairment of mitochondrial function in primate brain. J Neurochem 60:1964–1967. (2006) Inhibition of an equilibrative nucleoside transporter by cannabidiol: a mechanism of cannabinoid immunosuppression. Proc Natl Acad Sci U S A 103:7895–7900. (2000) Cannabinoids protect cells from oxidative cell death: a receptor-independent mechanism. J Pharmacol Exp Ther 293:807–812. (1988) Structural dependency of the inhibitory action of benzodiazepines and related compounds on the mitochondrial Na+-Ca2+ exchanger. Biochem Pharmacol 37:4399–4403. (2003) Apoptosis is induced by decline of mitochondrial ATP synthesis in erythroleukemia cells. Free Radic Biol Med 34:1190–1199. (1980) Chronic administration of cannabidiol to healthy volunteers and epileptic patients. Pharmacology 21:175–185. (2003) Inhibition of plasmalemmal Na+/Ca2+ exchange by mitochondrial Na+/Ca2+ exchange inhibitor 7-chloro-5-(2-chlorophenyl)-1,5-dihydro-4,1-benzothiazepin-2(3H)-one (CGP-37157) in cerebellar granule cells. Biochem Pharmacol 66:2409–2411. (2006) Molecular indices of oxidative stress and mitochondrial dysfunction occur early and often progress with severity of Alzheimer's disease. J Alzheimers Dis 9:167–181. (2008) Plant-derived cannabinoids modulate the activity of transient receptor potential channels of ankyrin type-1 and melastatin type-8. J Pharmacol Exp Ther 325:1007–1015. (1999) Bcl-2 protects against FCCP-induced apoptosis and mitochondrial membrane potential depolarization in PC12 cells. Biochim Biophys Acta 1428:357–371. (2008) Effect of dimebon on cognition, activities of daily living, behaviour, and global function in patients with mild-to-moderate Alzheimer's disease: a randomised, double-blind, placebo-controlled study. Lancet 372:207–215, dimebon investigators. (2003) Cannabinoids: mechanisms and therapeutic applications in the CNS. Curr Med Chem 10:2719–2732. (2006) Cannabidiol-induced intracellular Ca2+ elevations in hippocampal cells. Neuropharmacology 50:621–631. (2004) Mitochondria in health and disease: perspectives on a new mitochondrial biology. Mol Aspects Med 25:365–451. (2006) Neuroprotective and blood-retinal barrier-preserving effects of cannabidiol in experimental diabetes. Am J Pathol 168:235–244. (2006) Cannabidiol inhibits inducible nitric oxide synthase protein expression and nitric oxide production in beta-amyloid stimulated PC12 neurons through p38 MAP kinase and NF-kappaB involvement. Neurosci Lett 399:91–95. (2007) Cannabidiol, unlike synthetic cannabinoids, triggers activation of RBL-2H3 mast cells. J Leukoc Biol 81:1512–1522. (1999) Reversal of mitochondrial Na/Ca exchange during metabolic inhibition in rat cardiomyocytes. FEBS Lett 453:400–404. (1994) Anxiolytic effect of cannabidiol derivatives in the elevated plus-maze. Gen Pharmacol 25:161–164. (1996) Activation of mitogen-activated protein kinase by H2O2. Role in cell survival following oxidant injury. J Biol Chem 271:4138–4142. (2005) Comparison of cannabidiol, antioxidants, and diuretics in reversing binge ethanol-induced neurotoxicity. J Pharmacol Exp Ther 314:780–788. (1998) Cannabidiol and (-)Delta9-tetrahydrocannabinol are neuroprotective antioxidants. Proc Natl Acad Sci U S A 95:8268–8273. (2004) Nuclear and mitochondrial conversations in cell death: PARP-1 and AIF signaling. Trends Pharmacol Sci 25:259–264. (1976) Relationship between configuration, function, and permeability in calcium-treated mitochondria. J Biol Chem 251:5069–5077. (1998) A characterization of muscarinic receptor-mediated intracellular Ca2+ mobilization in cultured rat hippocampal neurones. J Physiol 511:747–759. (2004) Neuroprotective effect of cannabidiol, a non-psychoactive component from cannabis sativa, on beta-amyloid-induced toxicity in PC12 cells. J Neurochem 89:134–141. (1995) The sodium-calcium antiport of heart mitochondria is not electroneutral. J Biol Chem 270:672–678. (2004) Apoptosis in the central nervous system: mechanisms and protective strategies. Pol J Pharmacol 56:689–700. (1999) Presynaptically located CB1 cannabinoid receptors regulate GABA release from axon terminals of specific hippocampal interneurons. J Neurosci 19:4544–4558. (2005) Involvement of cannabinoid receptors in the regulation of neurotransmitter release in the rodent striatum: a combined immunochemical and pharmacological analysis. J Neurosci 25:2874–2884. (2007) Modulation of hippocampal calcium signalling and plasticity by serine/threonine protein phosphatases. J Neurochem 102:1009–1023. (1993) NMDA-dependent superoxide production and neurotoxicity. Nature 364:535–537. (2005) Cannabinoids provide neuroprotection against 6-hydroxydopamine toxicity in vivo and in vitro: relevance to Parkinson's disease. Neurobiol Dis 19:96–107. (2000) Different effects of nabilone and cannabidiol on binocular depth inversion in man. Pharmacol Biochem Behav 66:175–181. (2006) Antitumor activity of plant cannabinoids with emphasis on the effect of cannabidiol on human breast carcinoma. J Pharmacol Exp Ther 318:1375–1387. (2006) Cyclosporin A does not protect the disruption of the inner mitochondrial membrane potential induced by potassium ionophores in intact K562 cells. Cell Biol Int 30:197–204. (2006) The non-psychoactive cannabidiol triggers caspase activation and oxidative stress in human glioma cells. Cell Mol Life Sci 63:2057–2066. (2003) Neuronal and glial calcium signaling in Alzheimer's disease. Cell Calcium 34:385–397. (2007) Cannabidiol—recent advances. Chem Biodivers 4:1678–1692. (2008) Mechanisms of prolonged presynaptic Ca2+ signaling and glutamate release induced by TRPV1 activation in rat sensory neurons. J Neurosci 28:5295–5311. (2005) Mitochondrial membrane depolarization and the selective death of dopaminergic neurons by rotenone: protective effect of coenzyme Q10. J Neurochem 93:1199–1208. (1978) The regulation of extramitochondrial free calcium ion concentration by rat liver mitochondria. Biochem J 176:463–474. (2005) Mitochondria and calcium signaling. Cell Calcium 38:311–317. (1985) Mechanism of inhibition of mitochondrial adenosine triphosphatase by dicyclohexylcarbodiimide and oligomycin: relationship to ATP synthesis. Proc Natl Acad Sci U S A 82:1589–1593. (2004) in Cannabinoids, The pharmacology and therapeutic potential of cannabidiol, ed Di Marzo V (Kluwer Academic/Plenum Publishers, London), pp 32–83. (2007) Differential toxicity of novel aluminium compounds in hippocampal culture. Neurotoxicology 28:576–586. (2006) Mitochondria buffer NCX-mediated Ca2+-entry and limit its diffusion into vascular smooth muscle cells. Cell Calcium 40:359–371. (1998) Coupling between cytosolic and mitochondrial calcium oscillations: role in the regulation of hepatic metabolism. Biochim Biophys Acta 1366:17–32. (2006) Differential effects of cannabis extracts and pure plant cannabinoids on hippocampal neurones and glia. Neurosci Lett 408:236–241. (2007) Interactions of cannabidiol with endocannabinoid signalling in hippocampal tissue. Eur J Neurosci 25:2093–2102. (2003) Delta 9-tetrahydrocannabinol disrupts mitochondrial function and cell energetics. Am J Physiol Lung Cell Mol Physiol 284:L298–L306. (2005) A historical review of cellular calcium handling, with emphasis on mitochondria. Biochemistry (Mosc) 70:187–194. (1996) Cannabinoid receptor agonists inhibit glutamatergic synaptic transmission in rat hippocampal cultures. J Neurosci 16:4322–4334. (2002) Effect of chronic administration of R-(+)-[2,3-dihydro-5-methyl-3-[(morpholinyl)methyl]pyrrolo[1,2,3-de]-1,4-benzoxazinyl]-(1-naphthalenyl)methanone mesylate (WIN55,212–2) or delta(9)-tetrahydrocannabinol on cannabinoid receptor adaptation in mice. J Pharmacol Exp Ther 303:36–44. (2004) Participation of endoplasmic reticulum and mitochondrial calcium handling in apoptosis: more than just neighborhood? FEBS Lett 567:111–115. (2003) Mitochondrial Ca2+ uptake requires sustained Ca2+ release from the endoplasmic reticulum. J Biol Chem 278:15153–15161. (2005) Effects of cannabinoids on neurotransmission. Handb Exp Pharmacol 168:327–365. (1990) Regulation of the intracellular free calcium concentration in single rat dorsal root ganglion neurones in vitro. J Physiol 425:85–115. (2004) Menthol-induced Ca2+ release from presynaptic Ca2+ stores potentiates sensory synaptic transmission. J Neurosci 24:762–771. (2000) Mitochondrial targets of drug toxicity. Annu Rev Pharmacol Toxicol 40:353–388. (2003) Inositol 1,4,5-trisphosphate receptors modulate Ca2+ sparks and Ca2+ store content in vas deferens myocytes. Am J Physiol Cell Physiol 285:C195–C204. (2006) Mitochondrial DNA damage and the aging process: facts and imaginations. Free Radic Res 40:1284–1294. (2008) Mitochondrial Ca2+ signalling in hippocampal neurons. Cell Calcium 43:296–306. (1999) Cytosolic Ca2+ changes during in vitro ischemia in rat hippocampal slices: major roles for glutamate and Na+-dependent Ca2+ release from mitochondria. J Neurosci 19:3307–3315.